Everyone is eligible to join this contest. No age limit, no limitations, no nothing. As long as you pass all the requirements needed, then you instantly qualify, no questions asked. I will be posting the trivia before the second week of December and submission of entries shall be open from the time the trivia is up, until January the 1st, or New Year's Day. All validated entries shall then be drawn to determine who the winner will be. The prize for this shall be a personalized year 2002 calendar, delivered to your doorstep wherever you are in the world! Once the trivia is up, I will give further instructions as to how to submit your entries. The Fan Art Contest shall bear the theme, "Time and time again...", which means you have to draw ANY of the characters of Boys Be... in the light of how you perceive them to look like in the future. 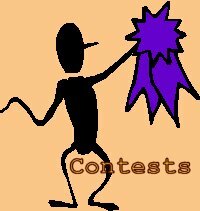 The prize for this contest shall be determined by the poll, and as with the "trivia contest", the delivery method shall be similar. Submission of entries start on December 1, 2001, and closes on January 1, 2002. Just send your drawing as an email attachment to saihis_emprs@edsamail.com.ph, along with your name and contact information, so in case you win, I can inform you about it straight away. I, along with a number of colleagues shall determine who the winner will be according to the following criteria for judging: Technique, Originality, Creativity, Texture, and over-all Exterior. Your drawings may be done in any style or form, and can either be black & white or colored, and may use any medium for drawing. So it follows that all and any material can be used for the illustration, which pretty much means it's all up to the discretion of the artist what action he/she will take. Then all you have to do afterwards is scan it and send it in. If you have any further questions, don't hesitate to direct them to myself via email. Thanks to you all, and Good Luck!! !